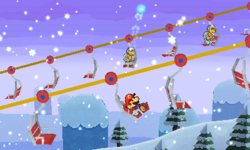 Whiteout Valley (known as White-Out Valley in the PAL version), formerly known as White Valley, is the fifth level of World 4 in Paper Mario: Sticker Star. Mario starts in a small snowy area with an Ice Bro and a Shiny Goomba. Soon after, he comes to an area with a Heart Block and an area for him to paperize the Forebear's Portrait scrap obtained in the prior level, The Enigmansion. Using the scrap will make the Toad steward appear. The Toad will give Mario and Kersti a lift. While on the ski lift, Mario must dodge enemies that attempt to attack him. If Mario comes in contact with an enemy or an attack, he must fight the enemy before continuing. It is nearly impossible gaining HP (except for a few Hearts) and stickers in this area. The first area on the lift contains coins, Ice Bros., and Fuzzies. The second area is a cave with larger groups of Fuzzies. The third area is similar to the first, but Shiny Paragoombas replace the Fuzzies. Along the way, Luigi will appear on a lift riding back down. As usual, he can be pulled off via Paperization. The end has stairs leading up to the Comet Piece. The music when riding the ski lift, named "Give Me a Lift", is a remix of the athletic theme from Super Mario Bros. 3. The first word of this level is a reference to "White-Out", a paint like substance that's used to get rid of marks on paper including pen ink or markers.